The strategy includes the replacement of dilapidated structures with vertical agriculture and housing merged with infrastructure. Former streets become snaking arteries of liveable spaces embedded with; renewable energy sources, soft cushion based vehicles for mobility, and productive green rooms. 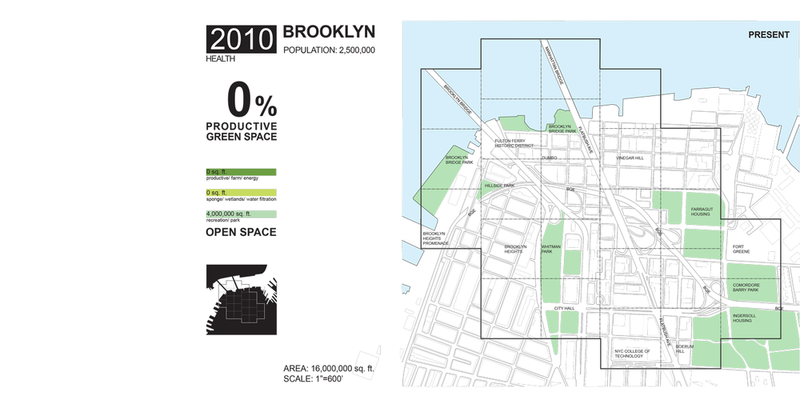 Our primary assertion for Brooklyn 2110 is that all necessities are provided inside its accessible physical borders. The plan uses the former street grid as the foundation for new networks. By reengineering the obsolete streets, we can install radically robust and ecologically active pathways. These operations are not just about a comprehensive model of tomorrow's city, but an initial platform for discourse. We think the future will necessitate marvelous dwellings coupled with a massive cyclical resource net. The future will happen, how we get there is dependent upon our planned preparation and egalitarian feedback.